Hint: It involves the food processor. Easy peas. Because the last thing you need to be doing 24 hours before the Thanksgiving Day culinary crush is making a pie crust by hand. Julia Child would agree. If this post seems like a cheap cop-out, well, it is and it isn't. Thanksgiving is less than a week away and while I had the prime opportunity this past week to bake myself into bliss developing the ONE pumpkin pie recipe your Thanksgiving holiday simply can't live without, I've been up to something else. You'll see :) Besides, in my humble and entirely irrelevant opinion the absolute best pumpkin pie recipe out there is on the back of the Libby's Pumpkin can. It's true. I won't presume to be able to come up with a better variation. One thing that can be tricky though? Pie crust. SO, with this short and sweet post, the highest and best holiday hostess gift I have to offer you. There can be a bit of confusion surrounding pie when it comes to matching the crust with the filling. I found this recipe almost a year ago right before I was set to do this big pie test shoot with a local photographer and have kept it in my back pocket ever since. It bakes beautifully underneath apples, berries, quiche filling, and pretty much anything else. For your pumpkin pie I'd take a cue from those questionable store-bought crusts and freeze it once you shape it into the pan. Pour in the filling and away you go. This thing I'm working on is a course launch. Food Styling for Food Bloggers. And a handful of others. I'm so excited I can barely literally focus on or accomplish anything else. I wake up. Barely eat. Rarely shower. It's the best/most terrifying/steepest learning curve thing I've done in a very, very long time but it's my before New Year's resolution to get it up and out there. Even if ultimately it fails miserably, there's nothing like being a million percent into something. So much fun and I can't wait to share more details. So like I said, short and sweet this time but if it's about quality over quantity, this post wins. This recipe is one of my favorite best. 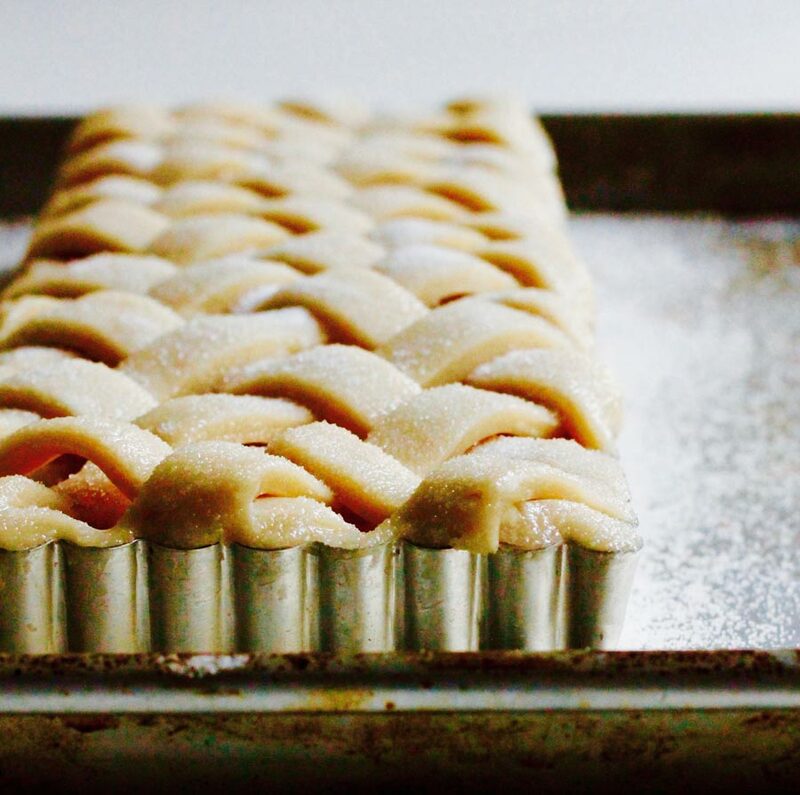 If not for the upcoming holiday, I hope you'll come back to it sooner than later with your next pie project. Have the absolute happiest Thanksgiving. I hope you'll be somewhere warm and familiar, like home, with family taking in all the pumpkin pie, couch time, and game day football you can handle. Catch you after. Want more baking & food styling tips? Check out the workshop series for full-on food styling classes and subscribe for access to an online library of food styling and baking resources. In the bowl of a food processor, pulse together the dry ingredients. Add the butter and shortening and pulse 10-15 times or until mixture is sandy and resembles course meal. Add 5 tablespoons of the ice water and pulse to combine, adding more until the mixture comes together. The dough should hold together easily when pinched. Turn the dough out onto a sheet of plastic wrap. Gather it together and shape it into a round, flat disk. Wrap in plastic wrap and smooth the edges with your hands until no creases remain. This will help to keep the edges from splitting when you go to roll it out. Transfer to the fridge and allow the dough to rest for at least an hour. When you're ready to use it, pull the dough from the fridge and let it temper on the counter for 5-10 minutes. On a lightly floured surface, roll the dough to 1/4 inch thick giving it 1/4 turn with every pass. Roll the dough around the pin and transfer to the pie pan. Trim the edges so that you have about an inch of overhang and crimp decoratively. Freeze for 20 minutes or until ready to use. If your recipe calls for blind baking, do it. Otherwise pour in the filling, top with the lattice (if using), and brush with the egg white mixture and sprinkle with sugar. Bake according to the directions of your recipe or at 400 degrees until golden brown.